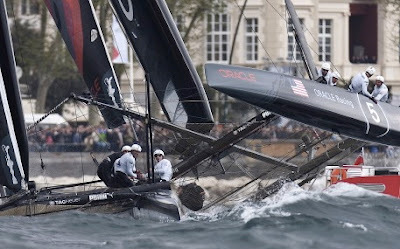 With the penultimate event of the 2011-12 America’s Cup World Series set to begin in one week on the canals of Venice, Italy, skipper Jimmy Spithill has rotated the crew that moved into the overall lead at the previous event and team CEO Russell Coutts returns to the fray aboard Darren Bundock’s AC45. Both the Spithill and Bundock crews will race the America’s Cup World Series-Venice, scheduled May 17-20, under the team’s new colors: ORACLE TEAM USA. The crew changes came about due to scheduling conflicts and the desire to give more sailors time on the physically demanding AC45’s. Coutts fills in for Tom Slingsby, who’s in the midst of an Olympic campaign in the singlehanded Laser class. “With Tom now totally focused on the London Olympics, changes were always on the cards for the fifth and sixth rounds of the ACWS,” said Spithill. 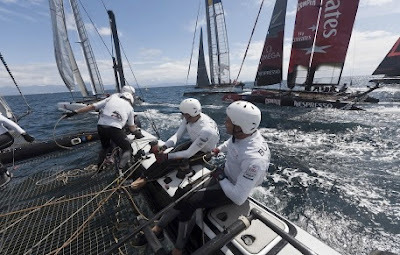 “As a team we have two simultaneous objectives: We want both crews on the podium when the ACWS season concludes and, with just 15 months remaining until we go out on San Francisco Bay and fight to retain the America’s Cup, we need to rotate our squad in the extreme race competition the World Series provides,” Spithill said. Also joining the lineup in Venice is the 2010 America’s Cup-winning bowman Brad Webb, one of the longest-tenured team members. Webb will make his World Series debut in Venice in place of Piet van Nieuwenhuijzen. 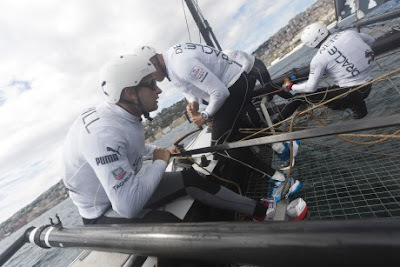 And the two crews will swap wing trimmers: Dirk de Ridder jumping to Bundock’s crew and Kyle Langford joining Spithill’s. “The AC World Series is the ideal proving ground for developing crew communications in the heat of competition,” added Spithill. Bundock welcomes the chance to race with Coutts. “Russell brings a lot of experience in a tactical role,” he said. ORACLE TEAM USA Spithill grabbed the overall lead in Naples last month by placing second in the nine-race series. 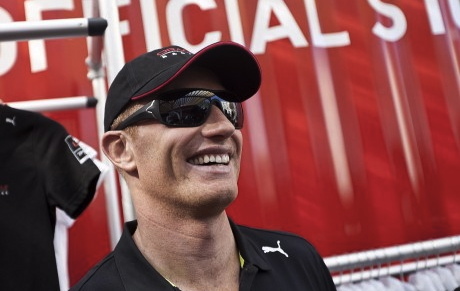 That helped skipper Jimmy Spithill and his five-man crew leapfrog Emirates Team New Zealand into the top spot. Spithill holds a 1 point lead in the overall standings. ORACLE TEAM USA BUNDOCK is placed fifth, 20 points behind Spithill. ACWS Venice is the fifth of six stops in the inaugural America’s Cup World Series. The 2011-12 season finale is scheduled for Newport, R.I., home to the Cup for more than 50 years, in late June.